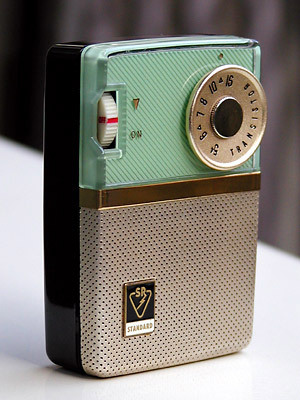 This 4-transistor radio sure is one sweet little piece of work. The entire front cabinet piece is reverse painted, including the area you can't see behind the speaker grille. The clear plastic used is incredibly thick, adding a wonderful feeling of depth to the surface and transparent views through the edges when viewed from the side or angles. While I don't yet have solid documentation on the Standard SR-D210, the sample pictured here was built in the first month or two of 1959. Your guess is as good as mine as to how long the product cycle lasted. But here again we see a big difference between the date this model must have been released and the one that shows in the one price guide in which it appears. (Lane & Lane dates this model as from 1962). To read more comments on dating early Japanese transistor radios, click here.